FEDERAL AND STATE EXTENSION WORKERS. WHEAT: ACREAGE SEEDED. YIELD PER ACRE. YIELDS PER ACRE CAUSED LARGELY BY DROUGHT AND RUST. by approximately the amount of our exports. tion in its report on June 9 and will issue its first estimate on July 10.
pected to be somewhat above average, although about the same as last year. the Crop Reporting Board April 10.
percent. The increase for 14 European countries reporting was one percent. growing conditions resulted in record crops in most of the European countries. is expected to be smaller th-tn that of 1938.
significant extent b':-fore June 30, the end. f the current season. world markets, although the crop is the second largest in history. in other e.nortir.g countries, however, has depressed oroort prices. Soviet 1Russia and China except where noted. average was 22 million acres. crop is indicated at 46 million acres. with the exception of 1934.
other spring wh.-at are 15 percent below the average for this period. ch:i-nes in prices, or other conditions which cannot be foreseen. nr.cr_:'ase slightly although most States show no chrnqe from last year. durum and other spring wheat beginning with 1926.
for the probable effect of weather conditions during last summer and fall. normal in most parts of the country excepting California and the Southwest. in mostly good to fair condition. plowed up by farmers to comply with acren.e allotments. made for still more effective control operations in 1939.
year beginnin.- July 1, 1938.
crop would result in a greater reduction in domestic supplies. to ie more than double the 595 million-bushel world carry-over July 19lS. result in a world production in excess of the likely disappearance in 1939-40.
estimates for the same countries in 1938 (table 1). 4/ See text and table, priu 16.
tal (2) . . .
Sr m .. . ....... .
S ia ... . . .
ij Estimate of the Paris office of the Department of Agriculture. I Plantings to January 1. I Estimate of the Belgrade office of the Department of A culture. dependent on weather conditions for the rest of the .-row'.- season. is exy-ected to be smaller than that of I0J-. all wheat in the Danube Basin, as favorable. Though acreage seeded in the. year prospects are for a 1539 harvest .-:.maller than the record crcp of 1938.
as at the same time a year ago. preparation of the soil is reported.to have been more general than is usual. those of last year at the same date. and a good crop is in prospect. of the crop is now reported to be fairly good. their administration are expected to result in incra ,-nes in those areas. than in 1938, when the yield was below average. f'ro 1 to 107', ir:--.1ly as a result of incresi-" acre . clined sharply, largely is a result of measures taken ? cast at 73 million bushels. general decline in industrial activity and commodity prices. receive *b-:*.t .-? cents per bushel on the normal yield of their 1] otn nts. Torld wheat ,3rrr-o,.ver 1;: l-i- 1:LP .L re. is practically unchar. e fro..i t~e table published in the issue of a month ago. sie. l 12 -:ho-s wvorlO :at )rod action for the rast 4 ye.;rs. supply and distribution beginning -ith 1922. Itm ,-,-.r bc-in.in uZl- ..
lion bushels new? ;-:heat in commercial and merchant mill stocks. mnaintained. Forecasted imr ort by European countries are shown in tatre 14.
for the :>th .... no s.
ports for Tth ea>r a .l-. .n Jul 1, 937. -- '' "19r T ___. v. Ju_ J.
Austr li. ......... ... .: 124 80 ;.) . J/ -ot-l -lies less domestic rci.quirements and car'ry-over. ?J Loan stocks not inducted. 3] See text. not i-' rts less -:. :--rrts accounted for. .*.. n.r.ts to non-E ,-rpea'. countries. Ar.-r ci-n.ificant extent before June 30, the e:i. of the current season. Credit Corr.or. 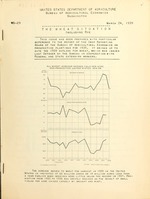 tion.. As of M-rch 8, 1939, 82 million bushels of wheat were plh--. under loan r..re.':nti'.. : 23 million bushels of wheat stored on the farm, which lor:.-. vators, which loans mature 7 months from their respective dates. 7ill be e-:-han,-ed for other wheat which is suitable for *-r:;.t. exc-'orts from Soviet Russia are expected to total about 37 million bushels. Wheat prices in important foreign markets declined during the past month. nl o: political developments in Europe. 2 & -' 7 -- 5. -.7 --. : -. 2 2/ 5.2 76.0 62.S 65..
20 : 6.6 75.3 --- 2'. 73-9 57. 17 : 7.7 76.2 62.2 2. 10 74.8 -- 6' 61 . -2 "c. 2 Yellow EH-,: Winter. / ..russo. / .o. 2 Dark .a:-. inter. million in 1933. F- .. small wheat crop:, however, rcul:ed sto . on a -n-.- -trabe basis to about 1C million Tbuhels ": Jy 1, 137.
a- uct 61, il ion -..els. were exnort.l -mder conrlitions of r ':ced cr- tition be-'.- ..:e o -..
li93, because of lar-: domestic and world supplies of wheact. of wheat used for feed compared with last year is no;w exnocted. of the stocks available for export 10/ accordi.r. : to an announcement made March 14.
are ..-. i. i"The T.eat Situation", February 23, 1939, 1:...s 18, 19.
: !..i. bLu. Mil. bu. Pr' actionn ............................: 6 .
jInd1 -771 flour in tern" of wheat. 1,0, in::tead of 1,085 because production was 930,801,000 bu -.-Is. Domestic prices continued to be su.-r rted '' the G vernment e.Y rt a~. per bushel for the week ended February 17 (table 7) while in Liverpool dur<. cents and Canadian No. 3 Manitoba 3 cents (table 4). would be without the export and loan programs. : 19l8: 1939: 1938: 1939 : 1938 : 1939 :1938:1939:1938:1939: 1938 : 1::. : Ct. Ct. Ct. Ct. Ct. Ct. Ct. Ct. Ct. Ct. Ct. Ct. Conversions at noon buying rate of exchange. .jrnury 7 to "..rch 18, 1. "-'.9 and corresr. '-nding dates for 19."=. March, April and May futures. 1/ Weekly -ver-rge of daily cash quotations, basis No. 1 sacked. 2/ January 7 to March 16, 1939, and corresponding dates for 1938.
from winterkill may yet appear. ". . . . .
._............................ I, 052 1 1 2 (.."
age relationship between the old boundary acreage in 1937 crd 1 33. 2/ Planti:.:.. to Jai-..;ary 1.
.',le 12.- i., tieted -roduction f ,wheat in s:ifie, i.
Canada ............. .. .........: 281 ,935 1 ,2 . -Argentina ...................... 141,462 249,193 184, .:- 319, "
early in 19:.'. 2/ Excluding Soviet Russia. Table 13.- .Tr.-. 'ct surplus for export or carr'. '-over in three exportir. : ..':il. u.. i" 1. 'i l '. . In '.a. .... ........ : 226 < 51 I"
Total ............... ... : 7 .
tion f:r the yver, minus --n.+hly r:-r-rts to date. 1/ F-recasts by European offices of U. S. Department of Agriculture. / Less than 500,000 bushels. 4/ Net exports of- lss thar 5C0,000 bushels. l 1i,0 -.j 7iO O 1 i,"
shipments 2I . : 4s,67 0 27.56 6 2 .
i/ In-ludes flour milled in bond from foreign ...eat. ?/ Pr:,omhall's Corn Tr-die :e-.'s. clearances of wheat, and estimates of flour shipments. 4/ Official -*' arts received from 16 principal ports only. 5 Black S:a shipments only. buit does not include items 2 a-.d 3. Compiled from Broomhall's Corn Trade News. Thstc data represent exports through 16 of the principal ports.